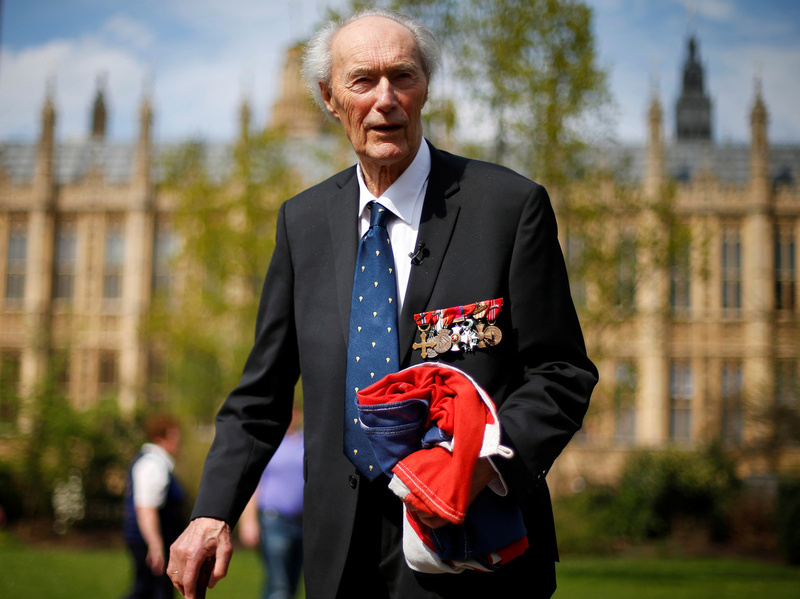 Joachim Roenneberg, Who Sabotaged Nazis' Nuclear Hopes, Dies At 99 Roenneberg was just 23 when his team of resistance fighters parachuted into a mountain range in Norway. They skied to a plant making heavy water and blew Hitler's atomic plans off-schedule. World War II Norwegian resistance fighter Joachim Roenneberg, seen here in 2013, has died at age 99. He led a team that was credited with slowing Hitler's plan to build atomic weapons. Joachim Roenneberg, who led a small team that sabotaged the Nazis' nuclear hopes during World War II, has died at the age of 99. Norwegian Prime Minister Erna Solberg announced Roenneberg's death on Sunday, calling him a hero. Roenneberg had fled Norway after Germany invaded in 1940. But he, like many of Norway's famed resistance fighters, wasn't content to cede his country to Adolf Hitler and the Nazis. After reaching Britain, he trained with the U.K.'s fledgling Special Operations Executive to learn guerrilla tactics and plot against the occupation. The chance to strike back came after the Allies designated the Vemork plant a crucial target because of its place in Germany's war plans. And when dozens of British commandos were killed trying to neutralize the plant in late 1942, the decision was made to send in Roenneberg and a handful of other Norwegian agents. The operation's code name was Gunnerside. It has been hailed as one of the most successful clandestine operations of the war — and it was accomplished without firing a shot. Roenneberg and his team used their mountaineering skills — skiing through treacherous guarded terrain and scaling cliffs to avoid detection — both to destroy their target and to escape the furious pursuit that followed. The daring operation has inspired stories and books and the 1965 war movie The Heroes of Telemark (named for the region in Norway where the mission took place), starring Kirk Douglas and Richard Harris. Interest spiked most recently in 2014, when Norwegian public broadcaster NRK produced a popular six-part series called The Heavy Water War. Even as they carried out their intrepid attack, the Norwegian squad knew their chance of succeeding was small — and that they had little chance of surviving. For years afterward, Roenneberg gave credit for the operation's success to his teammates. "I couldn't have a better party to follow me," he told the BBC in 2013. "We were a gang of friends doing a job together." And, he said, they had been very lucky. For every setback, there was a solution. When they landed miles off target during a storm, they found crucial supplies in a mountain cabin. When they needed to cut a padlock at the plant, they used a pair of metal shears that Roenneberg had brought along by chance. One of the most nerve-wracking moments, he later said, came after the explosives had been planted. The saboteurs had cut the fuses to give them only 30 seconds to escape. They scrambled out of the plant and started, again, to climb. But the explosives did their job, ruining the plant's production for months. And the blast eventually set off an intense search for the infiltrators. Just above the facility, Roenneberg and his team kept climbing, creeping up the mountainside. All along, they watched a cable car that could take the Germans quickly and easily up the mountain. But it never moved. ″We were scared to death," Roenneberg said. "If they used the cable car, we were done for." The team had trained meticulously on the plant's layout, using drawings and re-creations in Britain. That practice was crucial in finding and destroying the specialized equipment in the plant's basement. But as Roenneberg told the AP, the saboteurs had only the broadest of plans for what came after. ″Five of us had been ordered to head for Sweden afterwards, if there was any afterwards,″ he said. They skied for two weeks to reach Sweden, some 250 miles away. As they did so, they eluded thousands of German troops. Years later, Roenneberg told the BBC it was "the best skiing weekend I ever had." The operation slowed Germany's work on an atomic bomb, a project that was led by physicist Werner Heisenberg. When German troops took over Norway, the Nazi regime had made the Vemork hydroelectric plant, which was run by Norsk Hydro, a priority. Production of heavy water sharply increased — something that was noted by resistance informers who worked there and that caused alarm when it was reported to London. By sending months' worth of heavy water down the plant's drains, Roenneberg and his team bought the Allies extra time, which they used to send bombing runs and order other sabotage missions that crippled Germany's effort to acquire heavy water from Norway. The intrepid team's bravery was recognized with medals from Norway, Britain, the U.S. and other countries. But when the Norwegians carried out their exploit, they knew only that it was crucial to destroy tanks of liquid at the plant. It wasn't until the U.S. used atomic weapons that they understood the nature of the operation. "That was in August of 1945, when they dropped the bombs on Hiroshima and Nagasaki," Roenneberg told the BBC in 2013. "Because then we knew that what we had done had been of great importance. But not until then." "There is a lot of talk about 'never again,' but this is impossible if we don't remember what happened back then," Roenneberg told The New York Times in 2015.